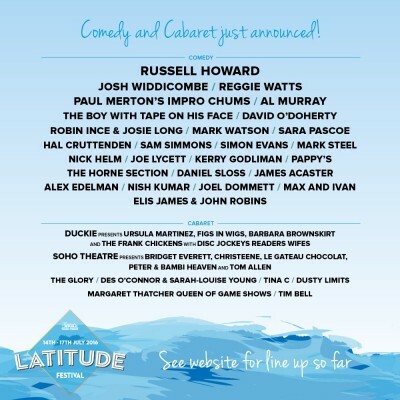 Not only does Latitude have a fantastic line up on the music stages, they’ve just gone and added some seriously amazing comedians to the festival. The satirist with a heart of gold. Russell Howard is a familiar face on our screens as a one of the very best current British television comedians. Having his very own BBC2 programme Russell Howard’s Good News, he also makes regular appearances on Mock The Week, 8 Out Of 10 Cats and Never Mind The Buzzcocks. Russell really feeds off a live audience and his best performances are when he’s allowed a platform with no real format or restrictions. So expect some great participation with the crowd. Known for his fantastic flights of whimsy and remaining ever deadpan despite exploring the truly weird, surreal and even dark comedy. Paul Merton is the master a master of odd satire. You will no doubt know him from the BBC’s Have I got News For You and Room 101 and excels on the stage. Multitalented, Reggie is a comedian, musician and beat boxer. His wildly hilarious and often improvised sets see him leading the audience down a merry path of confusion to great amusement. Pray silence please, for the gobbiest landlord is about to tell you exactly how it is. Armed with a huge arsenal of common sense plus a pint of best, Al Murray will set you straight whether you like it or not. Comedy acting that is so good, many don’t even realise that it is satire! Before finding fame on Channel 4’s The Last Leg, Josh built his name at the Edinburgh Fringe before becoming a regular on Stand Up For The Week. A sure-fire hit. Other comedy acts include The Boy With Tape On His Face, David O’Doherty, Mark Watson, Sara Pascoe and Hal Cruttenden. Festival comedy stages are a great place to catch up and coming comic talent as well as getting chance to see huge names in an intimate setting. Latitude have managed to round up some fantastic talent that’s well worth checking out. All this, plus The Maccabees, The National, New Order, Grimes, Kurt Vile And The Violators, Of Monsters And Men as well as many more! !